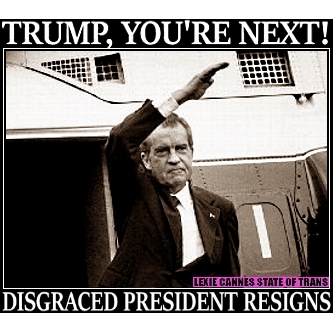 LEXIE CANNES STATE OF TRANS — True, President Trump can still wreck havoc with our lives, but know this, Trump has run into a wall of his own making. He has learned the hard way that there are consequences to his actions. With all his political capital spent, Trump will find very little support from our country’s institutions — Congress, the courts, the FBI and other intelligence agencies, and now, the US Department of Justice. Everywhere he turns, there will be push back. What exactly happens next for Trump? He could throw in the towel and quit by the time you read this, or engage in a reign of terror until the investigator, Robert Mueller issues his findings or an indictment. Trump has shown he is that volatile. On the upside, Mueller is an utterly upstanding person respected by both Republicans and Democrats. Any decision he reaches will likely be unchallenged by anyone on either side of the aisle. Except for Trump, of course. Mueller will have the resources and authority to go wherever the investigation leads. Think the Clintons and Whitewater. Kenneth Starr couldn’t find Clinton wrongdoing in Whitewater, but one investigation leads to others and in Clinton’s case, Starr nabbed him with a completely unrelated subject — Monica Lewinski. The investigation is likely to be lengthy, hamstringing Trump all the while, with the added bonus of denying Pence an early shot at the presidency. By the time the findings are announced, the Democrats may be on their way to winning control of Congress. Trump would likely quit than have his laundry aired publicly a second time if impeachment proceedings start. The president is permanently damaged politically. The chances of him serving his entire term is slim. The chances of a tarnished Pence winning in 2020 are quite poor at best, and without Trump’s boastful personality, Trump’s thugs will just stay home. The future is brighter than it has been for 7 long months. And an end is in sight. For trans people there’s actual hope for us once again. t/h to Acting Attorney General Rod Rosenstein who called for an investigator — a brave man who will get the cold shoulder from White House staffers, but is someone who Trump won’t dare fire. Note: News media is reporting Mueller’s title as either Special Prosecutor or Special Counsel. I am going with “investigator” for this article only. T/h to those of you that pointed this out! Well said. I so hope it rolls forward as you describe, and if so I suspect America will celebrate for days. You truly live in a dream world there is no way president will be impeached there is no impeachable action. into the Clinton foundation. And paid her husband $800,000 for speech dollars they just loved her. Which would be best for Russia which whole economy is based on oil president Donald Trump drilling for more oil everywhere are Hillary Clinton closing down oill drilling it doesn’t take a genius to figure that out. It was president Obama piss-off the Arab world. Opening up for Iran to get nuclear weapons . Now the whole Arab world will what nuclear weapons. Hopefully president Trump can stop them from having a nuclear arms race. there are so scared of Iran. That Saudi Arabia is getting friendly with Israel. Hoping to Have a Ally against Iran . It’s almost like he & his “team” are TRYING to martyr him. You seem to know very little about the Mideast. One Obama who made enemies of the Sunni Muslims.